Vladimir Sofronitsky ranks on a par with Rubinstein and Rachmaninov. He was admired by Prokofiev and Shostakovich. Horovitz recognized hios unique talent and Glazunov named him "one of the outstanding Russian pianists". "There is a seal of something inexplicable, almost super-natural and mysterious in his performance" - Heinrich Neuhause wrote. 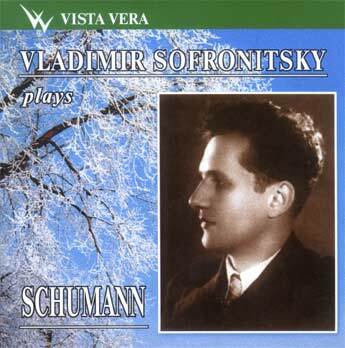 On this disc Sofronitsky plays Shumann - Arabesque, Carnival, Des Abends, Kreisleriana. The Russian company Vista Vera has now embarked on its own Sofronitsky programme. Certainly these Schumann performances enshrine uneven musicianship which at its best rises to exceptionally eloquent heights but which can also rely on less immediately appealing characteristics. In Carnaval for instance he takes time - understandably - to warm up but also indulges in some precipitous voicings and some harsh accents (in Preambule), quixotic tempo acceleration (Pierrot) and heavy handed phrasing (Coquette). This is the kind of performance to be judged on its own terms and reference to say, Rachmaninov's or Myra Hess's legendary recordings is best put to one side. Sofronitsky is aptly full of vigour and incisive rhythm in Lettres dansantes (though his speed here is relatively sedate) but does tend to make a bit of a meal of the rubato, voicings and dichotomy between rough rhythm and legato in Estrella. Kreisleriana amplifies these occasional extremes of response. In places he's quite expansive, and he tends to prefer relaxed nobility of rhythm to say, Horowitz's sense of momentum. That said his gravity and weighted chords in the fourth of the pieces (Sehr Langsam) is undeniably affecting and taken at a convincing tempo. Arabesque is also fine and an attractive reading. Uneven yes but unsettlingly human and with a technique still able to cope with most demands, Sofronitsky remains one of the troubling giants of post-War pianism.